I finished my Bavarois mittens last night! KALs are good for me, see? It feels so good to have knit both of them right in a row. Half the time when knitting mittens I knit the first one and then just make up excuses about why it doesn't need a mate. But since I plan on wearing these (and yes, because it's NaKniMitMo,) I'm feeling particularly efficient (or masochistic, take your pick,) so full pairs are the order of the day. The pattern for Bavarois should be available in the next couple of days, for those of you who are waiting for such things. You will be notified! 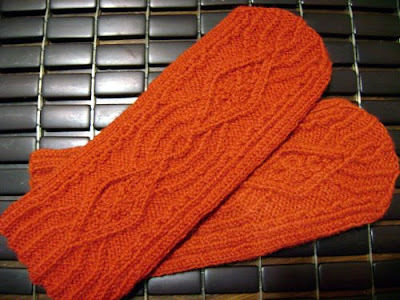 Which leads me to my next NaKniMitMo mittens: Meet the new mittens (working title: "Wurst.") 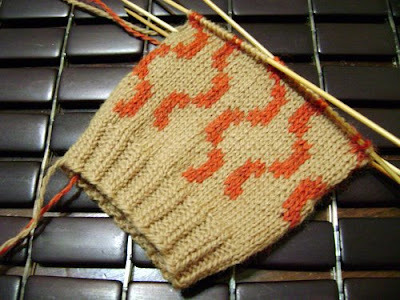 Because I just can't bear to live in a world where stylized sausage links have yet to appear on colourwork winter wear, and I know that some of you just might feel the same way, too. January 14, 2009 at 10:24 p.m.
January 14, 2009 at 10:54 p.m. I love love love link sausages as a stranded colourwork motif. Genius! January 15, 2009 at 3:21 a.m.
Bavarois is just stunning. Love them. And maybe it's because I make my own sausage but Wurst makes me giggle. Fantastic pattern there! January 15, 2009 at 6:55 a.m.
January 15, 2009 at 7:30 a.m. They're beautiful, I look forward to knitting them. January 15, 2009 at 2:16 p.m.